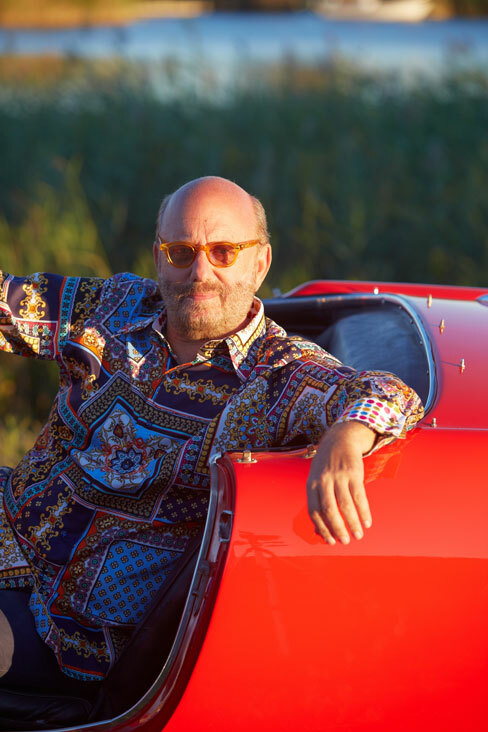 Robert Stock, co-founder of the menswear line Robert Graham, will appear at Sarasota’s The Met for a shirt signing on January 9. Robert Graham is a brand that has found enormous success with fashion rule-breakers by believing that the devil is in the details….of a print, that is. And by not taking style all too seriously, either. So it was cool to get to know Robert Graham co-founder Robert Stock,who gave me an insightful interview on everything from what you’d find on his nightstand to the coveted Robert Graham Collector’s Club. And by the way, you can pop by The Met on Friday, January 9 to shake the hand of the Stock, who commoditized the colorful mixed print; he’ll be there for a shirt signing from 5-7 p.m. Plus, there’s a sneak peek at the spring collection Saturday, January 10 from 10 a.m.-6 p.m., and there’s a swank gift with purchase for the first clients there. What are you most proud of in the brand’s history? I’m most proud of Robert Graham’s loyal customer base. How many other brands do you know where a cocktail party conversation centers around the men competing over the number of limited edition shirts they own from Robert Graham? How many other brands do you know where men buy three of the same shirt so they can have one in each home they own and visit? It’s remarkable! Your design aesthetic is anything but boring and you’ve commoditized the mixed print for men – where do you go from here? Our approach to fashion design extends beyond the literal theme of cleverly and intricately mixed fabrics, trims and embellishments. Our design aesthetic includes style offerings that range from “core” [staple pieces] to “fashion basic” [a step up from a core piece, with more detail and pattern] to “fashion” [colorful clothing with a nod to current trends], and provides a breadth of options across the fashion spectrum. From here, we’re continuing to expand our product categories with the launch of loungewear, fragrance and tailored clothing collections in the fall. What goes into creating a brilliant Robert Graham garment? Some of the innovative techniques used by our design team include laser cut trims in place of traditional embroidery–a technique that diversifies Robert Graham’s cuffs and neckbands from the rest of the industry–and double-cloth jacquards on many limited-edition styles. We also achieve photorealistic jacquards by playing with different weave structures, emphasizing the highs and lows of fabric. Color is used to accentuate the varying weaves, creating a rich textured look on the sport shirts. Other techniques for jacquards include double beams, satin/sateen [warp/weft-faced weaves], satin overlays, engineered repeats, and using specialty yarns like such as mélange, nap, and slub. [We also like to put] quotations under the collars, referencing literary, musical and philosophical icons. Tell us something we’d be surprised to know about the brand….. I founded Robert Graham because I felt menswear, at the time, was somewhat boring, and I thought developing a more lively, vibrant collection would certainly help spice up the American men’s market. Through the years, we’ve stayed true to our design aesthetic, but now we have a much larger team and more time to put into creating very intricate, handcrafted prints from the most luxurious fabrics. I just learned about the Collector’s Club– could you share a little about it with our readers? We launched The Collector’s Club as a loyalty program designed to reward customers for any Robert Graham item purchased at every price level (from $1 to $50,000). Collectors are rewarded with signature perks and access to one-of-a-kind brand experiences based on their tier of membership. such as a sneak peek of an upcoming collection, an exclusive personal shopping stylist and the privilege of selecting and naming a limited-edition shirt, just to name a few. Be the shout, not the echo. I look at shoes as art. I look at their workmanship and details. To me, they’re little sculptures. What would we find on your nightstand? On my nightstand, I have 50 different colognes, collar stays and a pad and pen to jot down ideas as I [come up with them]. Join us on January 9 and meet the man behind this iconic American brand, Robert Graham.